Well, this is rich. 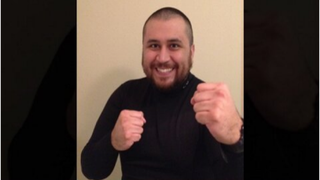 According to Radar Online, George Zimmerman has agreed to participate in a celebrity boxing match for charity. Which celebrity? We don't know, since Zimmerman is still looking for an opponent. But according to TMZ, the event promoter is not discriminating! Purple, yellow, white or black contenders can catch the fade. “It was my idea,” said Zimmerman. “Prior to the incident, I was actually going to the gym for weight loss and doing boxing-type training for weight loss, and a mutual friend put me in contact with Damon and provided me with an opportunity and motivation to get back in shape and continue with my weight-loss goals and also be able to help a charity out,” he said in the exclusive interview with Radar Online. And at least some of the proceeds will go to an unnamed animal-rescue charity. “I’d love to tell you [the charity], but unfortunately there’s so much animosity still from people out there that if I name the charity now, they would get bombarded with negativity, so I’d rather not,” he said. The match is set to air online and on pay-per-view on March 1, so long as Zimmerman can find someone to fight. Akoto Ofori-Atta is the editor of The Grapevine. Like her Facebook page and follow her on Twitter. Like The Root on Facebook. Follow us on Twitter. If you want to see what's hot on black Twitter, check out The Chatterati.Akoto Ofori-Atta is the editor of The Grapevine. Like her Facebook page and follow her on Twitter.